ASK ABOUT ELECTRONIC REPEAT DISPENSING.....GREAT IF YOU'RE ON STABLE MEDICATION! SAVE TIME AND LET US SEND YOUR PRESCRIPTION TO THE CHEMIST AND AVOID THE MONTHLY ORDERING!! Mr Joe Barlow is now in training to become our new healthcare assistant! Joe is undergoing intensive training to be able to deliver services to the patients of Junction Surgery such as NHS Health-checks, Phlebotomy, Diabetic Foot checks, Health & Wellbeing advice, Vaccinations, Minor wound care, ECG's, and much more. He will be observing both GP's and Jan the nurse during consultation to broaden his learning opportunities. We would appreciate you understanding of his attendance during his learning period. is one of the 10 high impact actions that practices can take to free up GP time, according to NHS England, providing patients with a first point of contact which directs them to the most appropriate source of help’, which is not always the GP. All our staff will be trained in the art of redirecting patients ensuring that patients see the right healthcare professional in the right place at the right time. It requires the receptionist to be skilled and confident in sensitively ascertaining the nature of the patient’s need and exploring with them safe and appropriate options.’ These might include sources of advice and help from within or outside of the surgery. The aim is to free up GP time and improve the patient experience by ensuring they go to the service that best meet their health needs faster. A patient will still always be offered the option of seeing their GP, But now the general practice frontline staff will highlight an alternative healthcare professional or service they could access that could be more appropriate. This could be a choice of practice or specialist nurse, pharmacist, physiotherapist, or services such as 111 (to access an emergency dentist), social services, mental health support, minor ailments, community acute ophthalmology, contraception and sexual health, smoking cessation, a wide range of community support and voluntary services for carers, the elderly and more. More details of the services available will be published shortly. The links below will take you to their websites. The team at the Junction Surgery have been providing high quality care for patients in Moldgreen and surrounding areas for many years. 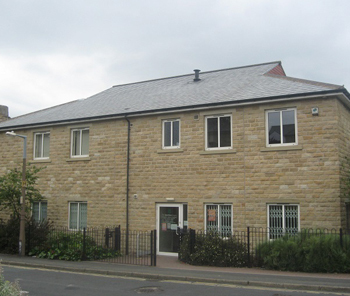 In 2006 we moved to a large purpose built surgery which allows us to offer a wide range of services to our patients. 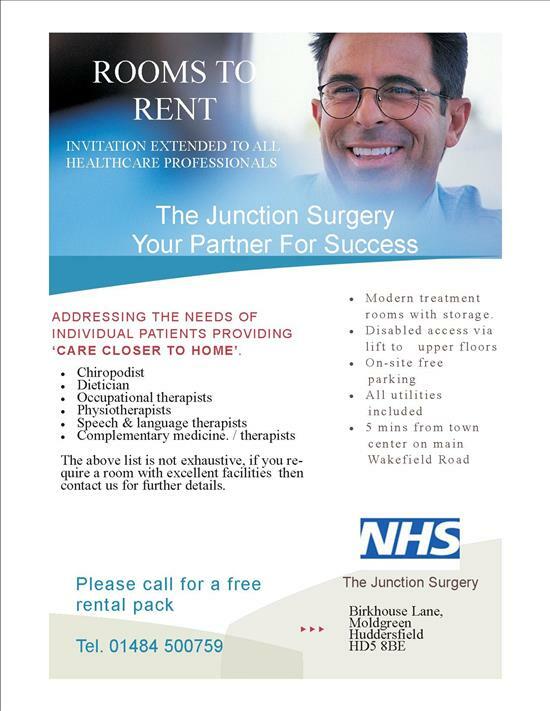 The Junction surgery aims to provide unprecendented care and services to the population of Moldgreen and its surrounding area. Our focus is on high quality, holistic care and treatment encouraging patient participation, engagement and feedback. Constantly embracing new technology and resources to give the ultimate patient experience. Appointments can be made by calling at the surgery, telephoning 01484 500759 or 01484 451188 between 8.15am and 6.30pm weekdays, or booking online. We are pleased to announce the provision of extended hours from April 2014 with a late surgery every Monday and a early morning surgery on Wednesday. These appointments are bookable in advance. Please ask at reception for further details. The Surgery premises have suitable access for disabled patients. We also have a portable induction loop to assist patients with hearing impairments. DUE TO SEVERAL UPSETTING INCIDENTS WITHIN THE LAST FEW WEEKS WE WOULD LIKE TO REMIND PATIENTS THAT THE JUNCTION SURGERY IS NOT AN EMERGENCY SERVICE AND THAT PATIENTS UNREASONABLY DEMANDING EMERGENCY TREATMENT WILL BE ASKED TO LEAVE. WE WILL HOWEVER TRY AND ACCOMMODATE REQUESTS FOR APPOINTMENTS WHERE URGENT TREATMENT MAY BE NECESSARY WHEREVER POSSIBLE. WE OPERATE A ZERO TOLERANCE POLICY IN LINE WITH NHS RECOMMENDATIONS AND REPEAT OFFENDERS WILL BE REMOVED FROM OUR LIST. A GP PRACTICE IS WHERE DOCTORS SEE ROUTINE MEDICAL CONDITIONS, REFERING ON TO SECONDARY CARE (HOSPITAL) WHERE REQUIRED. THERE IS NO COMPULSION FOR A DOCTOR TO REFER ONTO SECONDARY CARE IF HE/SHE FEELS THAT THIS IS NOT APPROPRIATE. REQUESTS FOR SICK NOTES AND PRESCRIPTIONS REQUIRE 24 HOURS FOR PROCESSING, PRIVATE FORMS OR LETTERS REQUIRE MUCH LONGER AND MAY TAKE SEVERAL WEEKS TO PROCESS. DEMANDS FOR THESE BEING PROCESSED SOONER WILL NOT BE TOLERATED AND MAY BE REFUSED ENTIRELY. WE ASK THAT PATIENTS TAKE THIS INTO CONSIDERATION WHEN ATTENDING THE SURGERY. Our team of healthcare professionals and back-up staff offer a number of clinics and services to promote good health and wellbeing whatever your medical condition. Please do familiarise yourself with some of the online features such as ordering a repeat prescription or booking an appointment. Simply register at reception for these services and use the links below once the receptionist has given you the log-in details.